Condoleezza Rice, President George W Bush's nominee as secretary of state, has identified "outposts of tyranny" where the US must help bring freedom. They are Cuba, Iran, North Korea, Zimbabwe, Burma and Belarus. Ms Rice was answering questions during a session of the US Senate, which is expected to confirm her in the post. The comments were reminiscent of Mr Bush's "axis of evil" speech in 2002, in which he identified Iraq, Iran and North Korea as threats to US security. Ms Rice is looking to make a fresh start in US diplomacy, says a BBC correspondent, but has faced tough questions over Iraq and President Bush's record so far. In her opening statement she made it clear that she believed greater efforts should now be made to put America's case to the world and listen to the response. "The time for diplomacy is now," she said. "Our interaction with the rest of the world must be a conversation, not a monologue." But she also said that in the first years of the 21st Century, liberty could be spread around the globe. "To be sure, in our world, there remain outposts of tyranny, and America stands with oppressed people on every continent, in Cuba, and Burma, and North Korea, and Iran, and Belarus, and Zimbabwe," she said. George Shire, a Zimbabwean political analyst with close links to President Robert Mugabe's Zanu-PF party, told the BBC it showed the US administration had not changed its approach and was still "a danger to the world". 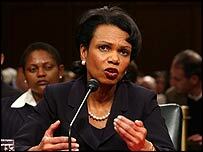 Much of the questioning Ms Rice faced at the Senate hearing concentrated on Iraq. She was asked to explain whether the number of US troops sent to Iraq was adequate, whether the Iraqi forces being trained would be in a position to replace them, and whether she could outline an exit strategy. She repeatedly declined to say when US forces might be home. Discussing the administration's insistence before the Iraq war that Saddam Hussein possessed weapons of mass destruction, one senator aggressively suggested Ms Rice's loyalty to Mr Bush "overwhelmed your respect for the truth". She denied that staunchly, telling Democrat Senator Barbara Boxer: "I really hope that you will refrain from impugning my integrity." Ms Rice, 50, faces a second day of questioning on Wednesday, after which the Senate Foreign Relations Committee will vote on whether to confirm her appointment. President Bush is due to be inaugurated for his second term on Thursday. "We are building a candid, co-operative and constructive relationship with China."